a kind of beefeater type place but a bit better. Food is overprice and a bit dull but the staff, the building, the atmosphere (when people are in there) and the garden is pretty good. there is a selection of drinks which should cater for most tastes and the wine is pretty nice. its also very much a family place with an outside play area and children's menu. pub is pretty big though so if you don't like sitting near kids you should be able to find another table further away. its a real mix of cliental so it feels inviting to all. Mixed feelings about this place, it's done out as a family dining pub which I would normally avoid, but it's been set out fairly well, and it has has kept a focus on a range of good beer which they look after well. Totally recomend, nice place well done good luck, best in the area. It has Badger First Gold on draught and Stinger in bottles, good service, friendly staff and tasty food. 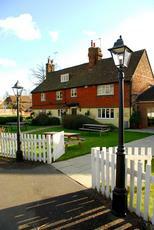 It is a large pub with plenty of places to sit down and a large beer garden. This place has been refurbed in a specific style ... and it just doesn't work . The beer is good , there are not many places where you get Fursty Ferret on draught, service is average but the whole place is a bit ..... Crossroads Motel for the new millenium ... a bit Harvester done good .